"This is a favorite in my house and preferred over restaurant steaks. 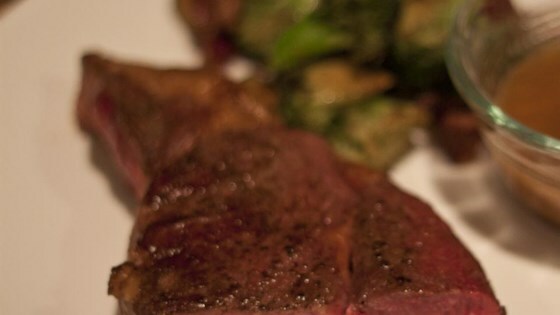 You get the quality and benefits of a steak cooked in grass-fed butter right in your own home. Paleo, low-carb, ketogenic friendly." Remove steak from the refrigerator at least 1 hour before cooking to allow it to come to room temperature. Season generously with salt and pepper. Heat an ovenproof skillet over medium-high heat. Add butter. Sear steak for 2 minutes; flip and cook on the other side, 2 minutes more. Place steak in the oven and cook for 10 to 20 minutes, depending on steak thickness and desired doneness. Let steak rest for 10 minutes before serving. Any piece of steak will do. I had a 1 1/2-inch steak that I cooked for18 minutes to medium. An inch-thick steak needs about 15 minutes to get to medium. Take off 2 or 3 minutes for medium-rare.